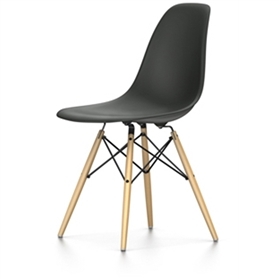 For the Dining Height Side Chair Wood Base (DSW), Charles and Ray Eames combined the organically shaped seat shell with a four-legged wooden base. The pairing of plastic and wood gives the classic design a certain warmth and casual appeal. The seat shells can be fitted with seat cushions or full upholstery in a wide selection of fabric colours, enabling a multitude of individual configurations.